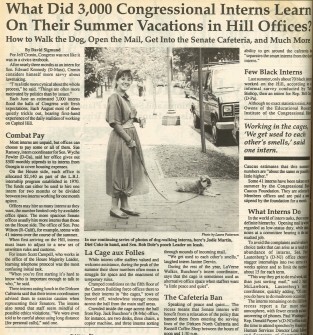 A recent visit to the Roll Call archives uncovered this 1989 photo of a young Senate intern from University of California, Santa Barbara named Jodie Martin walking then-Minority Leader Bob Dole&apos;s dog Leader 25 years ago this month. We tracked her down thanks to the power of the Internet — she&apos;s now Jodie Martin Ellis and works in the San Francisco Bay area. Reached via email, Martin Ellis recalled that interns were not usually "thrilled" to be tasked with the duty of walking the Kansan&apos;s appropriately named terrier, but on the day the photo was taken she was eager to get away from her desk. "I&apos;m a little foggy after all these years, but like most terriers, I believe Leader had a big attitude for a little dog," Martin Ellis said, adding that unlike Dole, "Leader&apos;s bark was bigger than his bite." In the years after UCSB, Martin Ellis worked for a time as an aide to another Kansas senator, Nancy Kassebaum. Martin Ellis said after that she went back to California, where she&apos;s been living for 17 years. The article that ran alongside Martin Ellis&apos; photo noted that new interns "must learn to adjust to a new set of unwritten rules and customs." One intern said "learning the telephone protocol was the most confusing initial task. &apos;When you&apos;re first starting, it&apos;s hard to know who is important enough to talk to who,&apos; he said." There was also a policy in place at the time that prevented interns from going to the Dirksen North Cafeteria and the Russell Coffee Shop between noon and 1:30 p.m., though those rules were relaxed during recess, Roll Call scribe David Sigmund noted in his article. An intern in Sen. Spark Matsunaga&apos;s office said he was surprised most by "the amount of air Congressmen can expend and say the same thing over and over."